The main reason a lot of you will buy Battlefield 3 for is the multiplayer gaming. You will not be disappointed in that area, especially since it supports 64 person multiplayer games (this is for PC only). Patrol the skies in an aircraft or fight on the ground in a vehicle or on foot. Battlefield 3 has beautiful graphics with good detail on objects when you look at them close up. [adblockingdetector id=”1″]Since the previous Battlefield they upped the ante in the graphics department. This means that your old Battlefield 2: Bad Company gaming PC needs to be upgraded. Battlefield 2’s minimum processor is any Intel Core2Duo. So even if you have an older, slow 1.8 GHz Core2Duo it will run. Battlefield 3 raises this requirement to an Intel Core2Duo 2.4 GHz. The Battlefield 2: Bad Company minimum graphics card is the GeForce 7800 GT. Battlefield 3 raises the minimum requirement to a GeForce 8800 GT. It is also important to note that unlike BF2, the newer Battlefield 3 does NOT support Windows XP. It only works on Windows 8, 7 and Vista (32 and 64-bit). 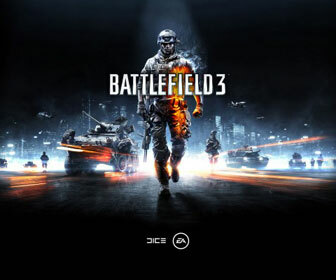 Looking at the Battlefield 3 minimum PC system requirements closely, it is the most hardware demanding PC game out as of the time of this writing. There are games that come close like Crysis 2’s system requirements, but Battlefield 3 edges it out since it requires a bit faster processor. If you really want to get the full detail with beautiful graphics being displayed on your HD LCD monitor I highly recommend having a quad-core processor and a GeForce GTX-series graphics card. Either way please compare your PCs system specifications with Battlefield 3s system requirements. – Processor on your computer? – Amount of RAM on your computer? – Graphic card on your computer? – Do you have a Desktop or Laptop? If you don’t know anything about your computer specifications that is not a problem. This tutorial will show you how to lookup all your important PC specs. If you have any QUESTIONS about INSTALLING Battlefield 3 or are not sure if your computer is COMPATIBLE with Battlefield 3, feel free to ASK FOR HELP BELOW!